With its bright purple flowers and attractive fragrance, the heather flower is native to many areas of the world, including North America, Scandinavia, Russia, and Ireland. In Scotland, though, this flower grows plentifully and is thus considered an important cultural symbol of the country. 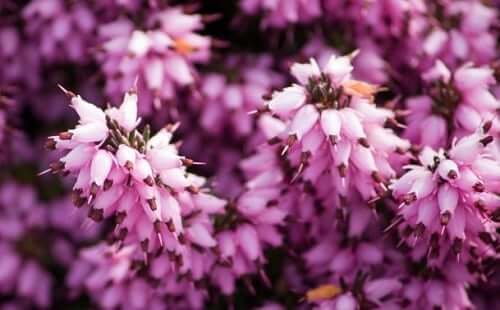 The heather flower meaning is known for its hardiness, strength, and the ability to survive and thrive in harsh conditions (such as rocky soil, extreme temperatures, and volatile weather). This has led to its acceptance as a great symbol of solitude and perseverance. Because of these characteristics and abilities, it played an important role in historical daily life. Heather flowers have long been used for practical purposes. For example, its twigs were utilized in the making of brooms, while the branches were used in the production of baskets, bedding, rope, and thatching for roofs. Heather was also used to flavor tea and even beer – this was before hops were identified as acceptable beer production ingredients. Heather symbol also has spiritual connotations in its symbolism, which is typically dependent on the color of the flower. The traditional lavender flowers are believed to show approval, beauty, and solitude, while white heather is thought to be useful in protecting oneself against danger. In older times, flowers were used to send messages between lovers, so the giver chose his bouquet very carefully. As purple heather was thought to signify beauty and admiration, males usually chose this flower when wooing their lovers. Scottish tradition values white the most, however. Heather flowers are said to be stained with the blood of Scotsmen and women as the result of brutal clan wars. Thus, the white, or pure and untainted from blood, are considered to be the luckiest for both the giver and the receiver. If the flowers are pink, tradition states that the plant is an emblem of good luck. As we have seen with many other plant symbolism, the Celts and Druids had very keen symbolic insights. These people were fantastic botanists and had an eye and mind for seeing the greater picture and purpose regarding not only each individual plant, but also each individual part. They were also resourceful people, utilizing any and all that was available to them in a respectful and non-wasteful manner. After experimenting, the ancient Celts found that the heather plant is actually quite useful for the body, as it acts as an effective and gentle cleansing agent when digested. Thus, it could break up blockages in the body, a revolutionary finding for the medical field at the time. As said above, heather was popularly used for producing brooms, acting even more literally as a cleansing tool. In addition to luck, protection, and beauty, Celts and Druids saw many other qualities symbolizes by the heather, including romance, hallucination, and attraction due to its enticing scent. The intoxication and romance can also be attributed to the strength of heather mead and the hallucinogenic properties of the ergo fungus that grows naturally on its leaves. Like other flowers, they also associated heather symbolic meanings with purity, cleansing and delicate refinement. These traits were (and to some extent still are) highly revered in Celtic cultures. In fact, heather is still commonly used in the bouquet of a bride or worn in her hair on the day of her wedding. Typically, the bride (especially in Scotland) chooses to use a sprig of white heather, as it is symbolic of future luck. No matter which color of heather one chooses or encounters, though, know that they are very powerful plants that can provide you with great comforts. Whether protecting you or filling you with unbridled passion, the heather flower is there to inspire and assist you in whatever life circumstances that you may find yourself in. Call upon it during times of trouble or use it to celebrate the greatness that occurs in the world.